This hand ladled, ash-ripened cheese is the flagship of the Vermont Creamery's signature line. Bonne Bouche literally means good mouthful. Made from pasteurized milk, the cheese curd is carefully hand ladled into moulds and drained overnight. Unmoulded, ashed and moved into the drying room to age, the entire process takes seven to ten days before the cheeses are packaged in their individual micro-caves. The challenge with Bonne Bouche's short shelf life is how to control its maturation between the dairy and the customer. Bonne Bouche leaves the dairy at 10 to 12 days old, when it is still far from ripe. Peak maturity occurs at 30 to 45 days, but the early release allows time for the cheese to travel, hang out in a distributor's warehouse, sit on another truck and finally make it to the retail counter. The dairy packs Bonne Bouche in what Hooper calls a "microcave," a wooden box topped with perforated plastic that permits the cheese to breathe in transport and while it sits on a store shelf. The date of production is stamped on the package, allowing shoppers to calculate whether the cheese in front of them is ripe, close to ripe or over the hill. Probing the surface with your thumb will give you the same information. Bonne Bouche ripens from the outside in, so it should have some give, but the rind should not look like it is sagging. 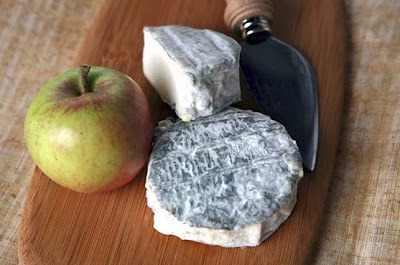 It has a white rind with a mottled gray wood ash applied to the cheese to raise the pH of the surface. 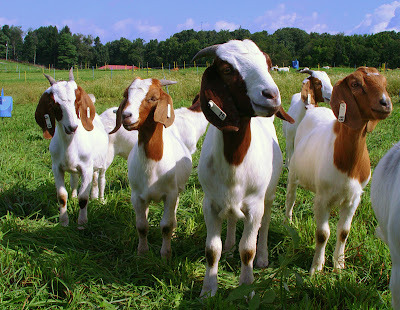 Young goat cheeses such as this one are quite tart initially; raising the surface pH encourages the desirable white mold to grow, helping to mature the cheese, transforming the interior from firm to creamy. 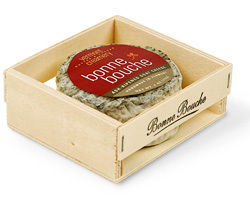 If properly ripe, Bonne Bouche will have a pleasant lactic aroma with no hint of ammonia and a uniformly white, smooth, dense yet silky interior. It should melt on the tongue. Smooth, creamy, and luxurious, serve it as part of a cheese board, or accompany a wedge with a simple mesclun salad. Sancerre is the classic match for the French cheese that inspired Bonne Bouche. A steely Sauvignon Blanc from California would be the domestic counterpart.